From about 7pm Major King, commander of the 10th Battery Canadian Field Artillery, requested cover from the infantry for his battery situated on the St. Julien-Keerselaere road. German infantry were digging in only a few hundred metres to the west of the battery. Major King was also under orders from 9pm to withdraw the battery from this dangerous position. A party of 60 men, under Lieutenant G W Stairs(2) of the 14th Battalion, was sent to the battery position, where the men entrenched. 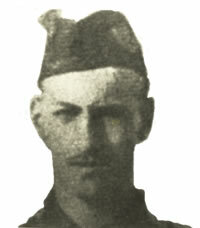 Lance-Corporal Fred Fisher asked for 8 volunteers for his machine-gun team. They went forward with the machine gun and got it into position in a building from where he could command the ground to the north and the west. He was under heavy fire from the Germans and four of his men became casualties. From this position he was able to hold up the German advance here. Later he took four more men with him to the firing line and again put his machine-gun into action against the enemy. Lance-Corporal Fred Fisher, awarded the Victoria Cross for his gallantry in action. “Fred Fisher and many other poor chaps of our Battalion are lying dead near St.Julien. "Bud" [Fred Fisher] made a glorious name for himself. He was in charge of a gun team in Reserve in the little village of St.Julien. When word of the attack on our line came back he took his team and gun and started for the front trenches. No one knew the way, but he came upon some artillery trying to get some big guns out under heavy fire. He set up his machine gun and covered their retirement. Proceeding forward again he cleared a bit of wood of Germans, becoming separated from most of his team. He also took charge of a French machine gun that had been abandoned and got it working again. For his gallant action on the evening of 22nd April Fred Fisher was posthumously awarded the highest award for gallantry for a member of the British and Commonwealth Forces, The Victoria Cross. “No. 24066 Lance-Corporal Frederick Fisher, 13th Canadian Battalion. On 23rd [sic 22nd] April 1915, in the neighbourhood of St. Julien, he went forward with the machine gun, of which he was in charge, under heavy fire, and most gallantly assisted in covering the retreat of a battery, losing four men of his gun team. Lance-Corporal Fisher was born in St. Catherines, Ontario on 3 August 1895. He served two years in the Toronto Public Schools Battalion, Cadet Corps. At the outbreak of war he was a student and enlisted in the 5th Regiment (Royal Highlanders of Canada) on 13 August 1914. He went overseas with the 13th Battalion (Royal Highlanders of Canada) in the Canadian Expeditionary Force. He was promoted to the rank of Lance-Corporal on 22 December 1914. According to the records of The Commonwealth War Graves Commission Frederick Fisher was killed on 24th April 1915, aged 22. (6) There is possibly a discrepancy about the date of his death, which is given as the 23rd April by the Official History of the Canadian Forces 1914-1919 and the history of the 13th Battalion. His next-of-kin details given by The Commonwealth War Graves Commission records are that he was the son of Mr W H Fisher of 100, Fort Street, Montreal. His grave in the trench where he was originally buried by his comrades was lost. He has no known grave and is commemorated on the Menin Gate Memorial to the Missing in Ypres (Ieper) [panel 24 - 26 - 28 - 30]. In 1970 a memorial plaque was dedicated in Montreal in memory of Fred Fisher.